There are many varieties of winter squash, pumpkin is just one of them. Pumpkin is probably the best known and most used member of the squash family. The most popular way to use pumpkin today is as pie. The pumpkin pie probably originated when some sliced off the pumpkin top, removed the seeds and filled the insides with milk, spices and honey and then baked it in hot coals. Today 99 percent of the pumpkins sold in this country are for jack-o'-lanterns at Halloween. These deep orange pumpkins are too stringy to eat and can be very large. They can easily weight 20 pounds and the very largest can exceed 200 pounds. For cooking the sugar pumpkin, a smaller, sweeter variety with close grained flesh is much better. Most people prefer canned pumpkin, which tastes as good as fresh and is much easier. The bright orange color of pumpkin tells you that it is loaded with an important antioxidant, beta-carotene. Beta-carotene is one of the plant carotenoids converted to vitamin A in the body. Current research tells us that a diet rich in foods containing vitamin A may reduce the risk of developing certain type of cancer and offers protection against heart disease. 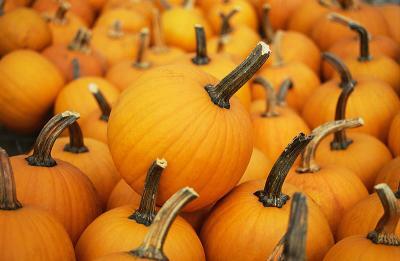 Pumpkin is low in calories, sodium and fat and high in fiber and vitamin A. Or: instead of spices, use 3/4 teaspoon pumpkin pie spice Preheat oven to 400 degrees F. Lightly grease a cookie sheet. In a large bowl toss the biscuit mix, brown sugar and spices. Stir in the pumpkin to make a very soft dough. Place a large sheet of waxed paper on the counter and sprinkle it with more flour. Flour your hands well and pat the dough into a square or rectangle about 1/2 inch thick. Use a knife to cut the dough into about 24 squares. Lift the biscuits gently to the cookie sheet with a flour spatula. Bake about 20 minutes or until cooked. I had a caller request a recipe for Pumpkin Fudge recently. Last year I was so curious I had to try some. It was good! Butter or grease one 8x8 inch pan. In a 3 quart saucepan, mix together sugar, milk, corn syrup, pumpkin and salt. Bring to a boil over high heat, stirring constantly. Reduce heat to medium and continue boiling. Do not stir. When mixture registers 232 degrees F (110 degrees C) on candy thermometer, or forms a soft ball when dropped into cold water, remove pan from heat. Stir in pumpkin pie spice, vanilla, butter and nuts. Cool to lukewarm (110 degrees F or 43 degrees C on candy thermometer). Beat mixture until it is very thick and loses some of its gloss. Quickly pour into a greased eight-inch pan. When firm cut into 36 squares.